Discover Mobile App for iPhone, iPad, BlackBerry and Android allows you to check account balances, transfer funds between accounts, see recent account activity, enroll in discover 5% cashback bonus programs, view interest earned by account and more. Discover Mobile app can used to manage your both Discover Card (Discover.com) or Discover Bank (Discoverbank.com) account. With mobile app you can also transfer funds between accounts. Discover Mobile App allows you to Send cash to just about anyone using Money Messenger from Discover. Discover is optimized for mobile web. Just type “www.Discover.com” or “www.DiscoverBank.com” on your mobile device browser and the mobile-optimized version of the Discover page should come up ( this page will also let you to download compatible version of mobile app for your mobile device). Discover Mobile Apps for iPhone, iPad, Android, Blackberry and mobile optimized website lets you to manage your Creditcard and Discover Online Bank accounts no matter where you are. How to download Discover Banking apps? or, download it from iTunes Store. 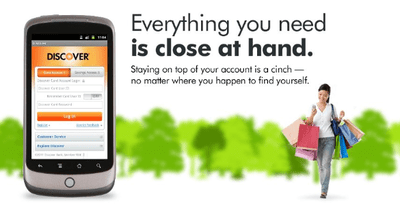 For more information about Discover Mobile, call 1-800-347-7000 or visit www.discoverbank.com/mobileapp.